In Dawn to Dusk, Lin Murphy invites us to follow her life pathway - from the beginning as a young woman whose values and choices were forged in the fires of the 60’s to the wise woman and poet she is today. Images of nature entwine with humor and the perspective that comes from the long view, and like all great poetry, Lin’s work is both personal AND universal. Judith Prest, LMSW, is a poet, mixed media artist, photographer and creativity coach. 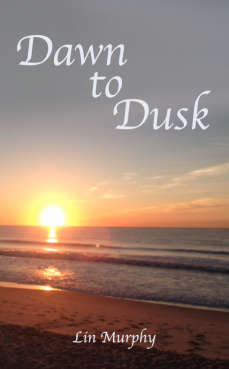 In her book, Dawn to Dusk Lin Murphy explores themes of spiritual growth, love, nature, and adventure within the larger fold of her journey as a woman through the many places of her life. Her well-crafted poems leave us with the lingering beauty of her words and their placement of everyday items of home against the longing of her spirit for deepening adventure. Later, as she moves through middle age and beyond, we are invited into a more complex voice, as with her lines The goddess meets herself on a rocky beach in Rhodes/ doesn’t know who she is. Lin gives us the gift of poems of beauty and insight that invite us to share in her journey, and at the same time consider our own. Sue Jefts is a published poet and facilitates poetry workshops. Lin Murphy, MA lives life as a poem. Lin is the founder and writer of the blog Wisdom, Wellness and Wonder. She is a Spiritual teacher and guide. She has given workshops and classes in Consciousness in venues from stone circles to colleges and churches.